One other place I really wanted to revisit on this trip was Battery Park City. BPC was our home for the latter 5 years in NYC. Had NYC not become so oppressive in terms of taxes, crowds, and noise, we could have stayed in BPC forever. One of my favorite activities in BPC was running along the Hudson River on the Esplanade. The area is especially stunning during this time of the year thanks to the fall foliage. the vibrant yellow mixes nicely with the reddish brown (unfortunately, I didn’t get to take any pictures because the two times I was down there was when I was running; and I don’t generally carry a camera on my runs). 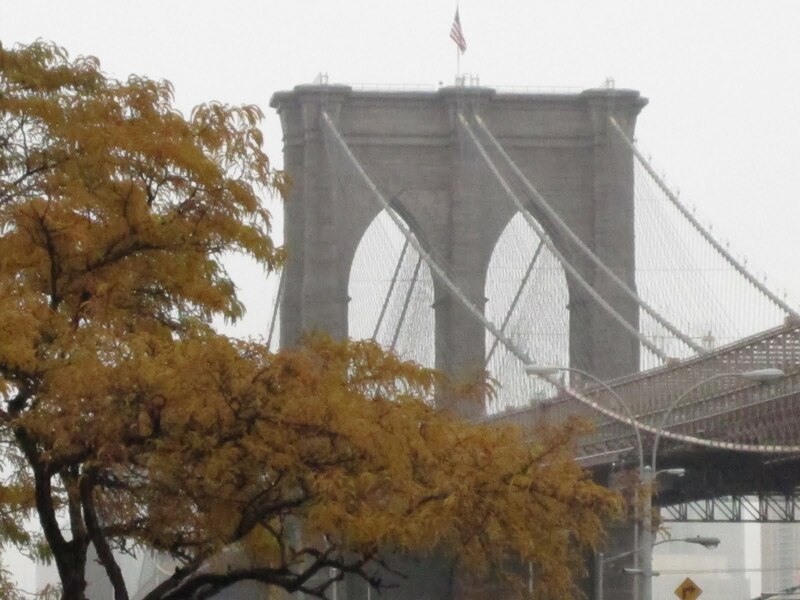 However, here’s a picture of some yellow foliage with the Brooklyn Bridge in the background, on a foggy day I might add. On Saturday, we met up with one of our friends, who still lives in BPC, to go running. We ran along the West Side highway and I was impressed with what the Parks Department had done with the old running and biking paths. Before we moved out of the city, everything between North BPC and W4 was just concrete, but now that whole section has been transformed into a park with trees and benches. On sunday, when I did my 18 miler, I had planned to run up to 59th and turn back, because back in 2005 the section between 59th and 72nd was just a dreary bike path underneath the West Side highway. However, when I got to 59th this time, I was pleasantly surprised to find that that ‘dreary section’ had also been spruced up. So I ended up running all the way to 83rd before turning back. 1) My Garmin worked terribly in the Wall St canyon. The satellite signals were spotty and weak. One second the watch showed that I was running at a 13 min mile pace, and the next second it showed I was going at a 3 min mile pace. 2) Running in NYC was much easier than running in Oro Valley, This was the same thing I noticed while running in San Diego. Must be the combination of low altitude and flat course. Usually I’ve just about had it at the end of my long runs in Oro Valley; but this time in NYC I felt like I still had 1/4 tank left in me at the end of the 18 miles. This entry was posted in NYC, Running, Travel. Bookmark the permalink.